While trapping on the Navajo Indian Reservation in the mid 80s, Mel Hershberger, a couple of fellow trappers and I, were sitting about camp one evening, sharing our events of the day. We were on the subject of 4-coiling. Everyone in those days was adding #1-1/2 coil springs to strengthen their traps. I had tried it, but I was not satisfied. During this discussion I came up with the idea, out of the blue, to make my own. I described my thoughts and everyone felt it was a good idea. I couldn't wait to get started on this new project. The name originated from the Taos, New Mexico, area where a lot of mountain men wintered and made whiskey – they called it Taos Lightning because of its punch (kick), and if you've ever tried any, you know what I mean. This is how the Taos Lightning™ Spring came about. The Best Designed 4-Coil System on the Market. Absolutely No Comparison! Demanded by both government and professional trappers. Easy to install. The double torsion springs are made from the highest quality music wire available. 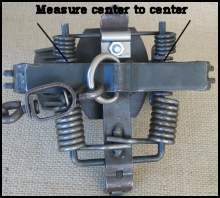 The spring pin is made from high tensile steel and will not bend. 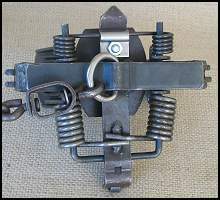 Heavy spring lock included. When powering up your trap, the main thing I like about 4 coiling over adding stronger replacement springs, is the 4 coil also gives the trap a more even balance when it's triggered.The extra power and speed you need without overdoing it. What's so convenient about the Taos Lightning™ Spring is once it's set up, all you have to do is loosen the lock, slide the spring off or on (depending on the ground condition and the power you need). Tighten the lock and you are ready to go. It's that simple. There are 19 kits available, and each includes the spring, longer heavy duty spring pin and lock. Comes in both standard and extra strong models. Kit #2 - Fits #3 Victor Round & Square Jaw (with 2-7/8" pin), #3 Victor Soft Catch, #3 Duke, Victor #4 Coyote 2x2 (with 2-7/8" pin). Kit #4 - Fits #1.75 Victor Pro, #1-3/4 Victor Round Jaw, #2 Victor Round Jaw, #1-3/4 Duke, and #2 Duke. 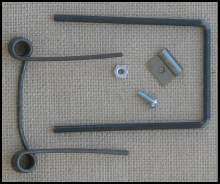 Kit #9 - Fits #1-1/2 Montgomery Round & Square Jaw, and #1-1/2 Montana Special. Use the Kit guide above to select pin from the pull-down menu on the Add to Order button. Use Kit guide above and select from the pull-down menu on the Add to Order button. Fits MB550 RC. Includes spring,clip, bolt,& nut only.